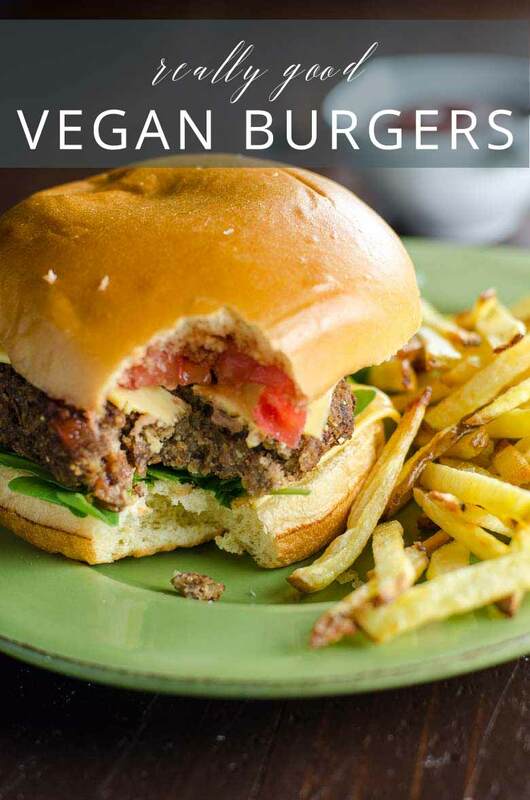 Made from a mix of savory shiitakes, lentils, brown rice and walnuts with plenty of umami-boosting condiments baked right into the patty, these really good veggie burgers as good for you as they are satisfying. But you won’t be thinking about their nutritional profile when you’re deciding how many pickle slices to put on top, or whether it’s a sriracha mayo kind of day. These veggie burgers are packed with umami-forward ingredients, making them just as savory as beef burgers, if not more so. I’m one of those people who thinks there’s room in the world for lots of kinds of veggie burgers. I’m cool with a falafel burger with grilled halloumi and harissa mayo (thank you Giraffe for making that a thing). I’m great with a marinated portobello cap between buns, even — especially! — if it’s decorated with all kinds of crazy nonsense. And give me a cumin-scented, slightly sweet vegan burger patty sometimes too. But even though I don’t always feel like eating ground beef, sometimes I just want a BURGER. Something I would slap inside a standard-issue bun and take to the fixins bar. A patty that cooperates with the rest of the burger experience instead of getting in the way. And that’s exactly what I’m sharing today. Finally. A really good veggie burger that’s just a really good veggie burger. 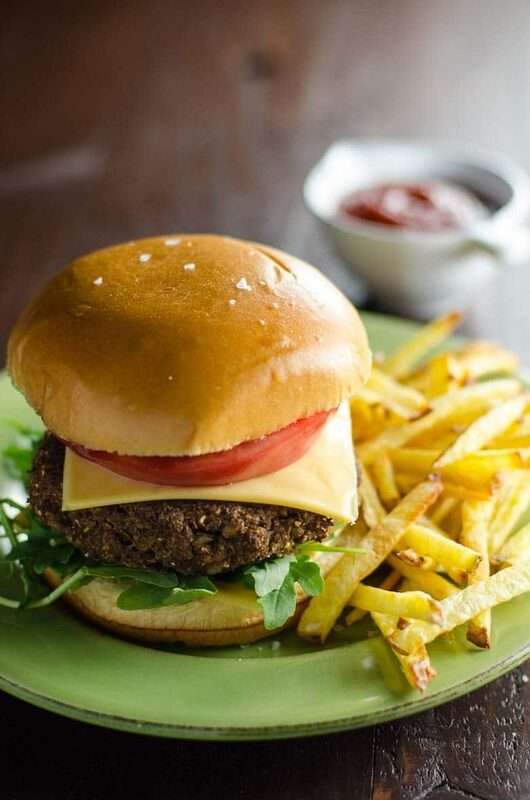 Made from a mix of savory shiitakes, lentils, brown rice and walnuts with plenty of umami-boosting condiments baked right into the patty, these veggie burgers as good for you as they are satisfying. 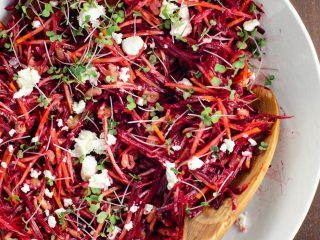 But you won’t be thinking about their nutritional profile when you’re deciding how many pickle slices to put on top, or whether it’s a sriracha mayo kind of day. 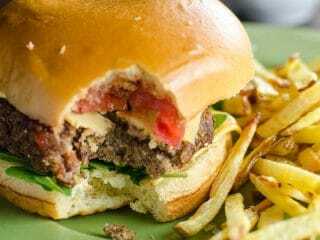 This recipe makes 10 good-sized burgers that keep well in the fridge for up to a week and reheat in the microwave, so you can make them ahead if you like. I suspect they would freeze well, too, but I haven’t tested it because they always disappear before I have the chance. Psst…like fries? Here ya go. 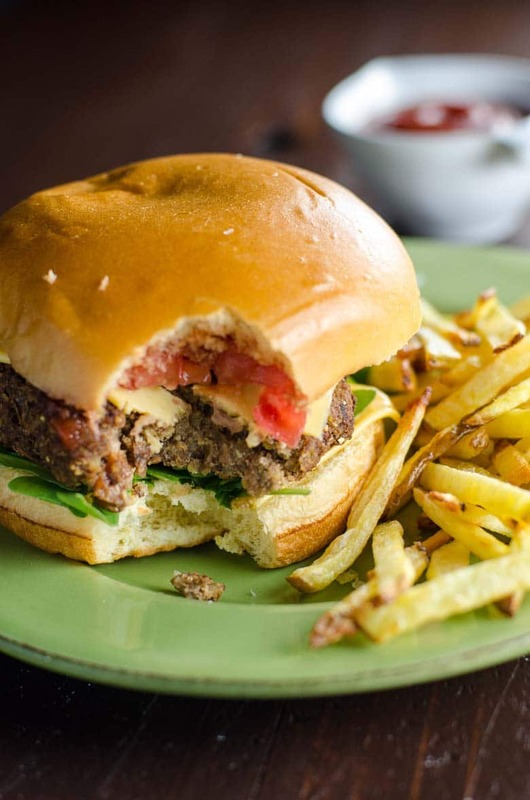 This veggie burger recipe has a great, savory flavor profile that works really well with all the usual burger toppings. It's nice and sturdy, too, so treat it just as you would a regular burger. In a medium pot, combine the lentils, rice, salt, herbes de Provence and three cups of water. Bring to a boil, then cover and simmer until water is absorbed and rice and lentils are cooked, about 40 minutes. Meanwhile, warm the oil in a 12-inch frying pan over medium-high heat. Add the onion and celery and cook, stirring occasionally, until beginning to soften, about five minutes. Stir in garlic and cook one minute more. Add the shiitakes as they fit into the pan and cook, stirring frequently, until browned in spots and about halved in volume, 10 minutes or so. Preheat oven to 450°F with two racks as near the center as possible. Line two baking sheets with parchment paper. Into a full-size food processor fitted with the blade, place the walnuts and the mushroom mixture. Pulse until finely chopped. Stir in the cooked rice and lentils and pulse a few times to combine. Transfer mixture to a large mixing bowl. Add the ketchup, tamari, flaxseed, mustard, marmite and black pepper and mix together thoroughly. Stir in the cornmeal. Form into 10 patties and place on baking sheets. Bake for 15 minutes, then flip each patty, rotate locations of pans and bake 15 minutes more. Serve 'er like a burger. (Sorry, I just had to.) These patties keep well in the fridge for up to a week and can be reheated in the microwave. Or you should be able to freeze cooked patties, though I haven't tried this yet because they always disappear within the week.